With the big response another class has been set. 1. this will be a ongoing month sat. glass as spaces fill up fast. 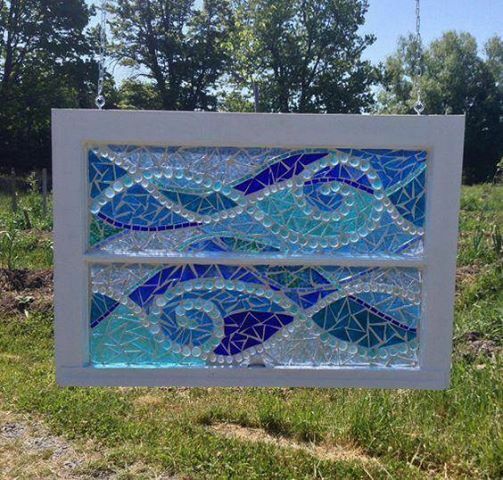 3. the supplies are a frame or window, special glue, stained glass, glass beads, shells, grout, and glass chips. 4. i will not be able to please everyone ha ha, but will do my best. 5. You will need to let me know if you want wood, black or white frames, size of frame, and colours you wish to use with glass and the beads. lf your doing a old barn window you will again need to let me know if you want it painted white, left with chipped white paint or painted black. They are about 24 by 24 inches. Prices will start at $135 for a 12 by 16 and go up from there. To give you a idea if you use a old barn window, price will be $155. l do have some 24 by 24 old barn windows. Looks like March 16th and March 23rd are the 2 class dates. Time is 10 am until about 4 pm. 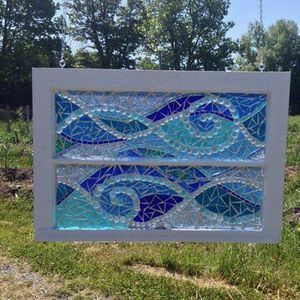 There will be a second class in the evening to grout your mosaic as the glue and glass need to dry. l hope l have explained this all correctly. 1/2 deposits are needed and are non refundable. l also make these and sell them. l have included a few photo's for you to see.